western creek | There once was a creek . . .
Way back in January, I reported that the City Council had begun constructing a floodgate at the mouth of Western Creek. This is the spot where the Milton Drain meets the river, right next to where the dilapidated shell of the old floating restaurant still stands. If you have passed by this spot in the last few months, you will have seen that the construction is complete: Western creek finally has its floodgate. 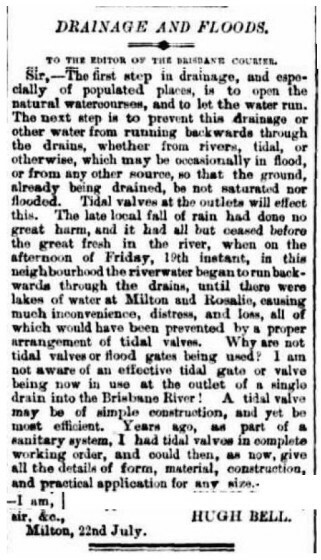 Hugh Bell’s letter to the editor of the Brisbane Courier in July 1889, arguing for the use of tidal valves to prevent flooding in Milton and Rosalie. I say ‘finally’ not because more than three and a half years have passed since the 2011 flood (some people might even call that response time quick), but because more than 125 years have passed since a floodgate at the mouth of Western Creek was first proposed. In July 1889, while the mud was still drying from a flood that peaked at 3.75m on the Port Office gauge (about 2 ft lower than the 2011 flood), a Milton resident named Hugh Bell wrote to the Brisbane Courier, asking “Why are not tidal valves or flood gates being used” to prevent flooding in Milton, Rosalie and other low-lying suburbs? This question was no doubt raised again in March of the following year, when the river peaked at 5.33m — just under the mark of the 1974 flood. 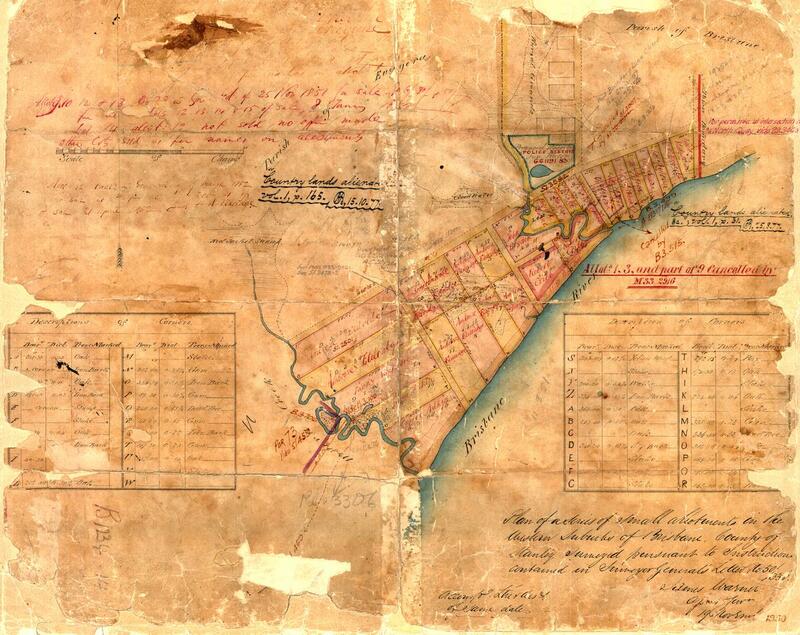 In response, the Toowong Shire Council in October 1890 unveiled an ambitious whole-of-shire1 drainage scheme which featured floodgates at the end of Western Creek and Langsville Creek. But the council could not afford to build the whole scheme, and so built it piecemeal instead. Some components, such as the drain through Red Jacket Swamp, took years to get finished, while the floodgates never materialised at all. So, it’s really happening. If this sign is to be believed, then Western Creek is finally going to have its floodgate. The photo was snapped at the entrance to the footbridge under Coronation Drive at the mouth of Western Creek (otherwise known as the Milton Drain) a few weeks ago by Steven Cowley, who has been my eyes on the ground at Western Creek ever since I moved to the southside last year. A few months ago I moved out of Rosalie and the catchment of Western Creek. I didn’t want to leave, but such is the plight of a renter. 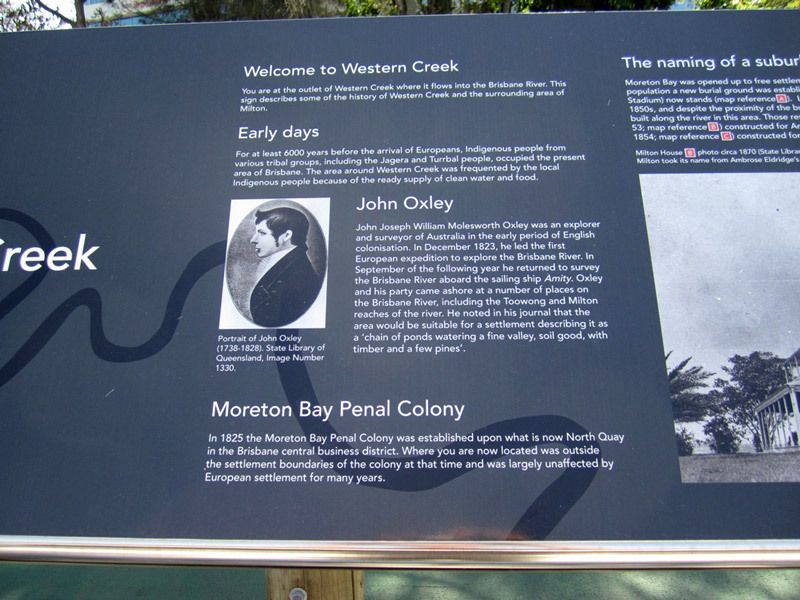 I now am a citizen of Oxley Creek, which runs through my new neighbourhood of Rocklea. 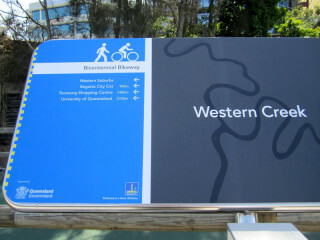 So these days I am writing about Western Creek from a bit of a distance. I no longer get to notice the day-to-day changes that happen in the area, like the height of the pond at Norman Buchan Park, the movement of the heaps of dirt in Frew Park, and the state of the new footbridge being built along the bikeway at the mouth of Western Creek. 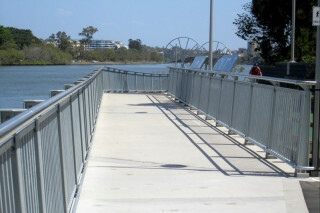 The new footbridge alongside the bikeway over the mouth of Western Creek (photo by Steven Cowley). Luckily there are locals still keeping an eye out for me. 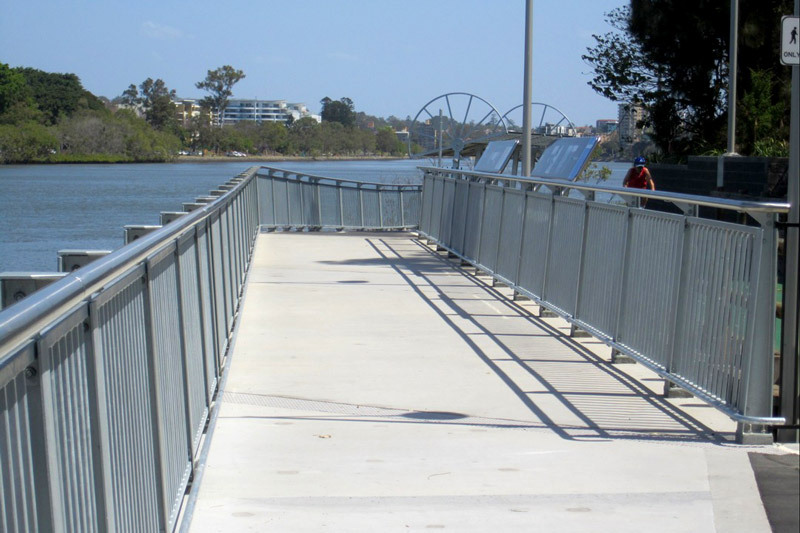 A few days ago I learned from Steven Cowley that the footbridge has been completed. To our delight and surprise, the new bridge includes two large educational signs dedicated to the history of Western Creek and its surrounds. 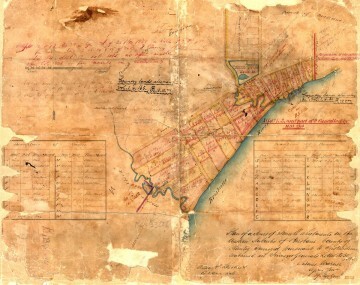 The first inhabitants, John Oxley’s arrival, the development of Milton, and the three creeks and bridges of the Milton Reach, are all covered. 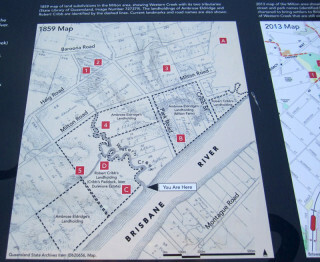 Accompanying the text are several large photographs from the State Library’s collection, and some maps illustrating the location of past and present landmarks, including Western Creek and Red Jacket Swamp. 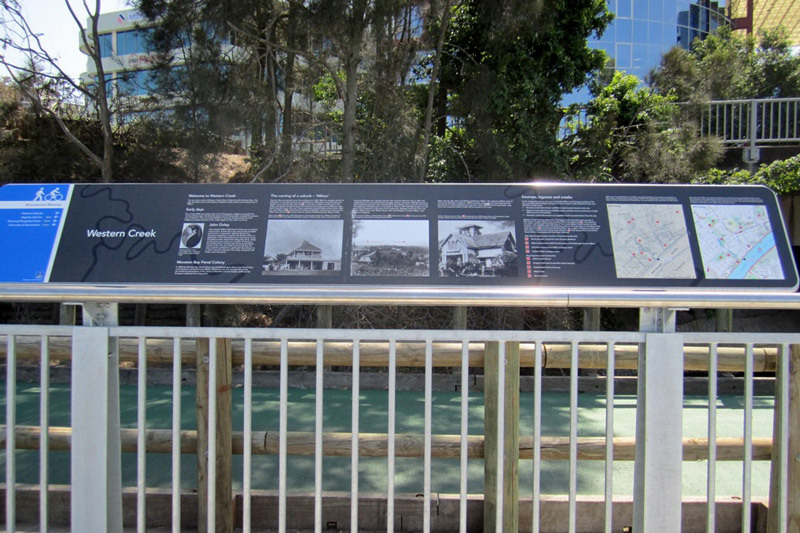 It is rather beautifully done, and I am quite touched to see the effort that the council (and/or the state government) has made to promote the history of Western Creek and the Milton Reach. 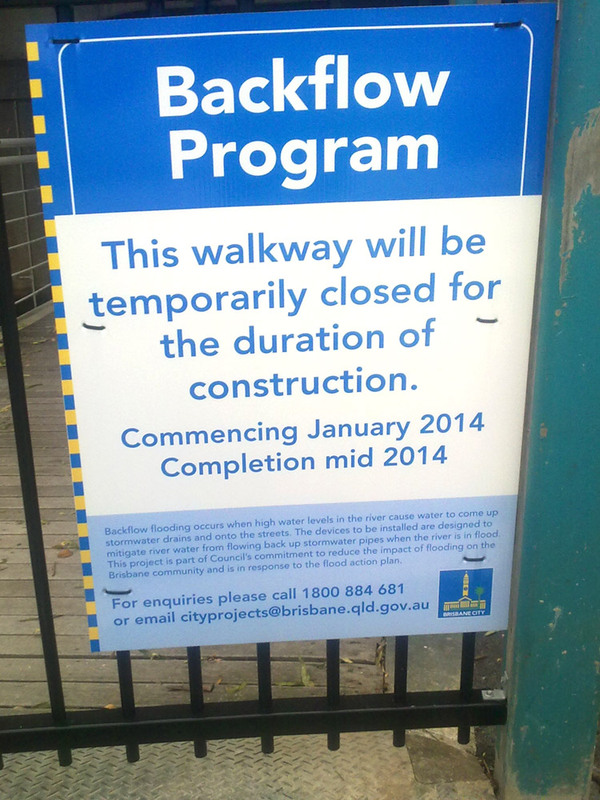 I hope that we will see more of these sorts of signs in Brisbane in the future. Since I started chasing lost creeks, I have been drawn to spaces that most people would tend to ignore or avoid. For example, I often find myself peering into drains, which in many urbanised areas are the only waterways left. I’m sometimes tempted to venture inside them, but I rarely do.1 Out in the suburbs I’ll look twice at any gully or ditch that has not been covered over. These watercourses sometimes run through scenic parks, but more often they are tucked away in roadside scrub or remnant bush. Exploring suburban gullies is hardly a taboo like venturing into drains, but neither is it a popular pursuit. For all of the prickles and scratches you are likely to endure, you can hardly expect to see nature at its finest. Yet to me, there’s a certain appeal about being in a space that in all likelihood has not been looked at for many days, walked through for many weeks, or cleaned up for several years or decades. Such places remind you that there are still things to discover in an otherwise predictable suburban environment. If you keep your eyes peeled in a place like this, you never know what you might find. I recently found myself in just such a place while exploring the headwaters of Langsville Creek. This creek exists only in fragments now, but it once flowed all the way from the Mount Coot-tha Quarry to the Brisbane River at Auchenflower. 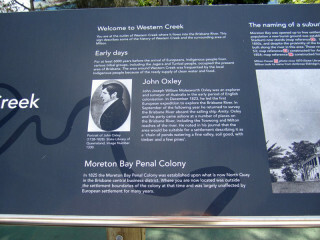 Its catchment neighbours that of Western Creek, the forgotten waterway that is the main focus of this website. My exploration of Langsville Creek had taken me to a patch of bushland between Mount Coot-tha Road and Birdwood Terrace. 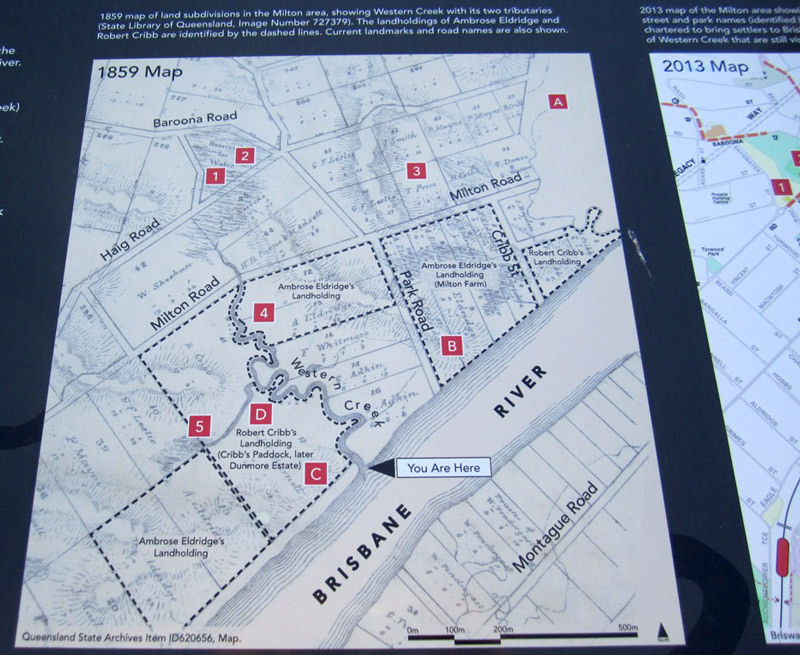 I followed the Old Mount Coot-tha Road from near the entrance to the botanical gardens, and walked downhill through a clearing not far from Walter Street. Before I knew it, I was at the bottom of a damp and weedy gully.